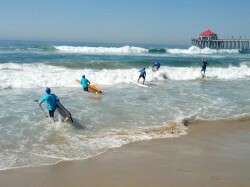 The awesome Surf Race To Victory series wrapped up today at Huntington Beach. 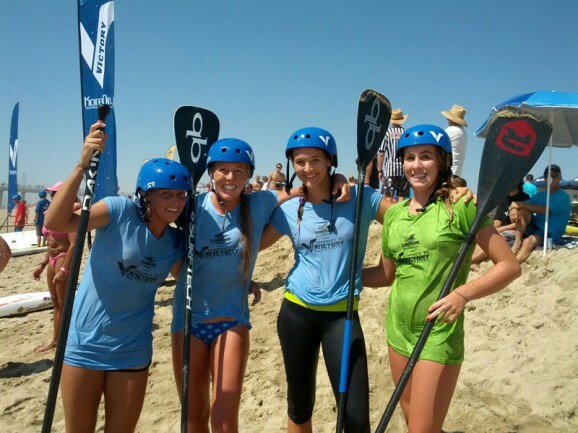 Plenty of pros have arrived in town ahead of the Battle of the Paddle, so there was a lot of talent on display. Plus with a decent swell pulsing along the coast, there was also a LOT of carnage. 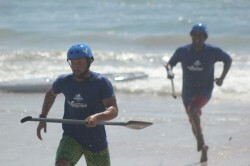 Combine that with blue-sky, 34 degree (93 F) weather and you had a pretty fun day of SUP racing. Several of the world’s best lined up for the knockout sprint format, with everyone looking uber-stylish in the event’s signature blue crash helmets. 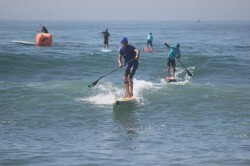 Kody Kerbox, Connor Baxter, Byron Kurt and Brennan Rose took out the first round heats, with Kerbox in particularly fine form. On the women’s side it seemed to be a battle between Candice Appleby and Morgan Hoesterey, with the pair trading victories in the first couple of rounds. 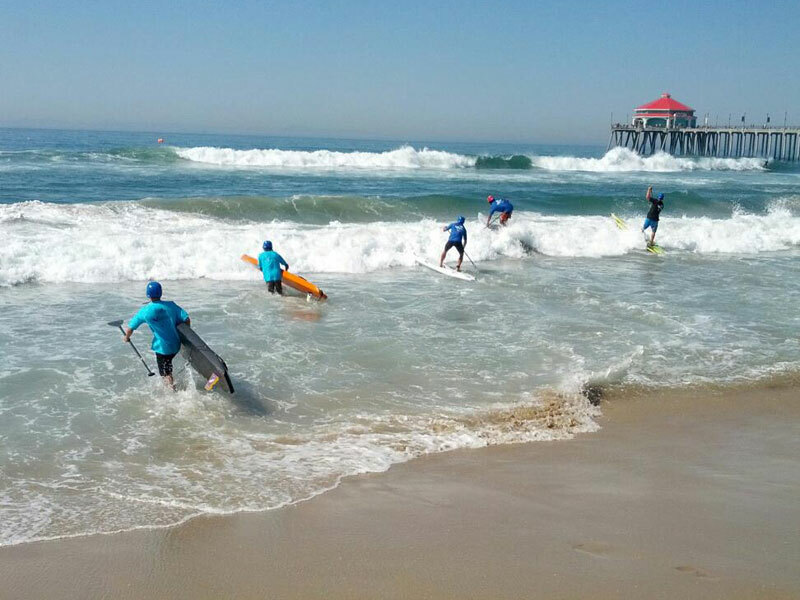 Before the semis and finals there was time for some SUP surfboard racing, which pretty much descended into chaos and carnage as solid swells rolled into Huntington. Meanwhile a couple of the Brackett kids braved the conditions (including a mean shore-break that was breaking over their heads) to compete in the junior’s race. Back in the pro event, Connor and Kody dominated the semis and were looking solid for the finals, while the old guard was being led by the likes of Anthony Vela and Byron Kurt. 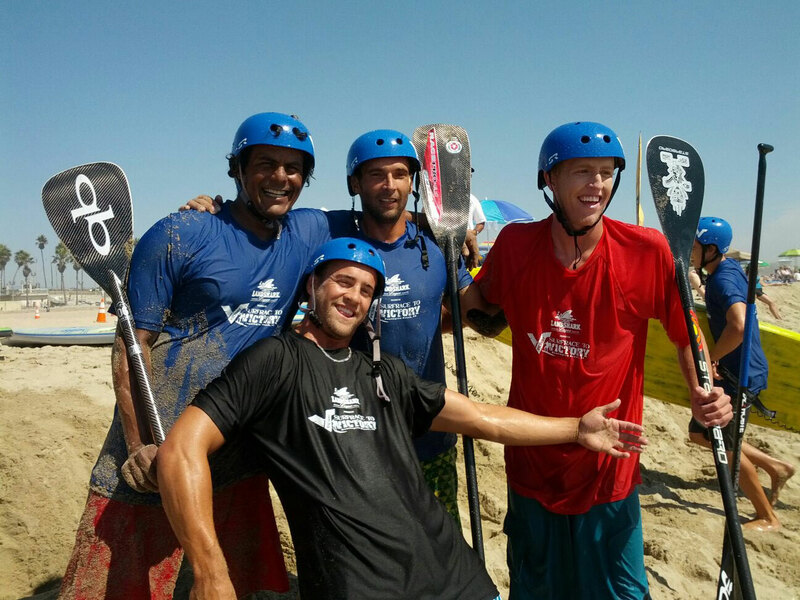 They were joined in the final by Mo Freitas, Brennan Rose, Dan Hughes and Frenchman Eric Terrien. Much to the crowd’s delight, a huge set started rolling towards the coast just as the final got underway. 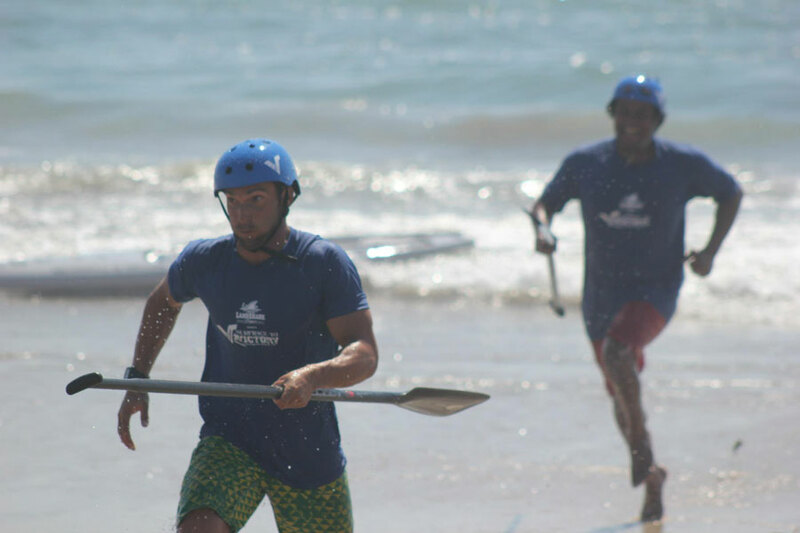 By the time the paddlers were 50-100m out from the beach, right in the impact zone, the waves started peaking at 4-6ft and were looking set to clean up the entire field. Most of the guys had to sit back and wait for the white water to settle down, but Anthony Vela was going all out for the win… With his trademark energy, Vela sprinted like crazy through the zone and somehow made it over three set waves in a row, punching his board through each one as it broke over the top of him. Vela’s heroics paid off; he established a strong lead and held it for most of the race, though the field started creeping up to him on the final leg. However another set held back most of the guys on the final outward paddle and it looked like Vela was in the clear, but France’s Eric Terrien held his nerve to make it through unscathed and find himself just metres behind Vela. From there it was a two horse race, with Terrien catching up to Vela on the final buoy and both of them surfing the same wave all the way back to the shore. In a mad dash for the line, it was Eric Terrien who took the honours, just a couple of metres ahead of Vela. Some poetic moments of man love (aka bear hugs rolling around in the sand) between Terrien and Vela followed, before Connor Baxter crossed the line to claim third ahead of the over 40’s champ, Byron Kurt. 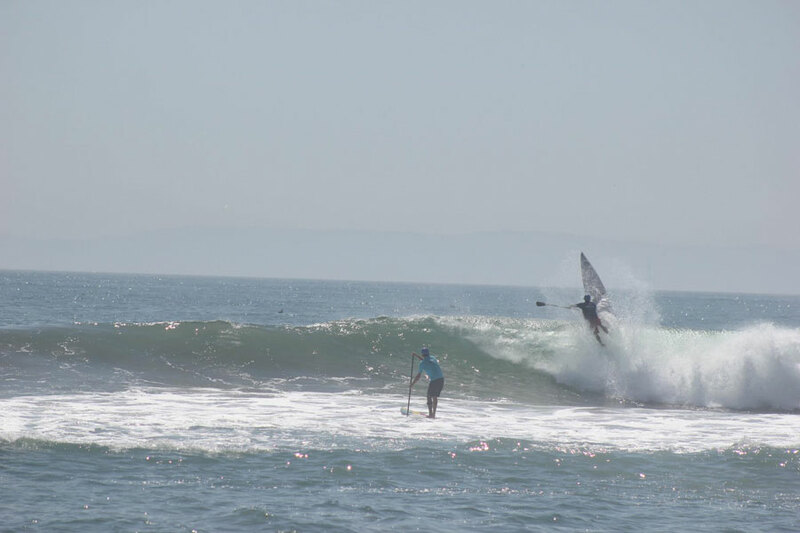 The massively in-form Kody Kerbox was unlucky to lose his paddle on a rogue wave, ruining his changes and sending him on a binge eating session to ease the pain. Connor Baxter had his share of misfortune as well, snapping his fin near the start of the final. 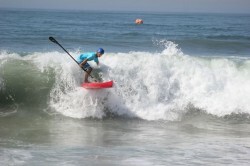 The fact he still managed third shows how much of a freak paddler he really is. Meanwhile in the women’s race it was Candice Appleby who survived the chaos and carnage to claim the cash. The Queen of the BoP held off a late charge from Halie Harrison and Morgan Hoesterey to defend her title and cement her place as one of the women to beat at Dana Point in a couple of weeks time. Check out the final Surf Race To Victory SUP Race results below, then take a look at our complete set of Surf Race To Victory photos.